Christopher Michael is a professional full-service catering company. 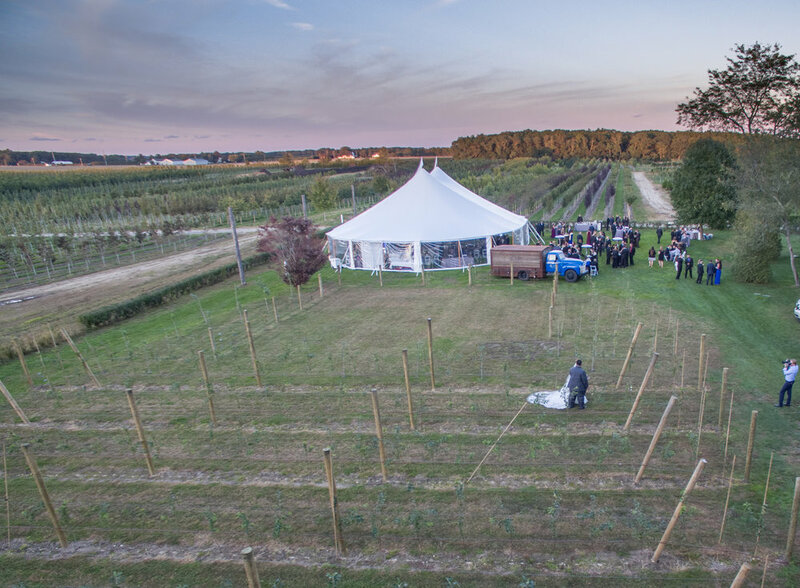 As a pioneer of off-site catering on the North Fork, Chef/Owner Matt Kar and his staff, will bring delicious food combined with efficient and delightful service to your large or small event. Named after his two sons, Christopher Michael has been bringing farm-to-fork food to events of all scales since 1993. As un-rivaled experts in event planning our team can guide you through the planning process accounting for every detail along the way. Our complimentary design team will make your special day unforgettable. Christopher Michael is the perfect caterer for your wedding, graduation party, birthday party, anniversary party, company party, corporate lunch, or rehearsal dinner. Each wedding and outdoor party has a unique style and our service varies along with it. At Christopher Michael we specialize in five service styles that will enhance your guests experience. French Style: French Style service allows for your guests to choose their food while still seated at their table. Our servers pair up and serve fresh food straight from the grill to your table for your convenience. The visual choice of proteins and sides creates an appetizing presentation sure to wow your guests. Delicious Duo: Our ‘Delicious Duo’ is a combination of your two choices of proteins along with sides. Each guest receives his or her own elegant individually plated dinner cooked to perfection. Whether it's filet mignon and chicken or tuna and short ribs, treat your guests to a duo of delicious. Buffet: Traditional buffet table is the classic way to service your guests. Beautifully decorated buffet tables add to the ambiance of your wedding and when finished with a carving station, your guests will be talking about the filet mignon for weeks. Family Style: Hot platters of food will be delivered to your table and guests dine 'family style' choosing what catches their eye. The perfect way to make sure everybody feels like family at your party. Cocktail Reception: Themed service tables give your guests the ability to experience different cuisines of your choosing. Each table not only looks the part but tastes the part. Common themes include a pasta table, Italian table, salad table, Greek Table, Irish Table and Mexican tables. Christopher Michael is proud to extend our services to your wedding's after party no matter how small or large. After hours food is a great way to refill after your wedding, while letting the party end in a relaxing way. Have your late night craving fulfilled. Hosting a Lobster Bake is a sensational way to treat your guests to the best the East End has to offer from the sea, the farm and the grill. Below are three delicious options that offer a glimpse to a full bounty of the region for the delight of your taste buds. Box lunches are a great choice for a stop at a vineyard or a company lunch. We have both a-la-carte options and inclusive packages to meet your needs. With over 20 years experience, Christopher Michael will make planning your big day effortless. No detail will be missed from start to finish. Our staff will handle everything from linens to coordinating to tent set up. We also provide a day of coordinator to make sure your wedding or outdoor party goes off without a hitch. Our year round staff with intimate knowledge of all local venues makes our team able to handle your unique event with ease. Let us be your tool to make your special day perfect. The design of your wedding or event brings character that enhances your guest’s visual experience. By working with our preferred vendors we have put together many different theme options for you to choose from. You can tailor your table decoration and theme to be as unique as you wish. Design your wedding to match your personalities or create that picture perfect wedding of your dreams. Our design team leader will work with you one-on-one to make sure your vision shines on your big day. Visiting our show room at the Jamesport Manor Inn will get your creative mind flowing. From there, all you have to do is dream it and let us make it your reality. Located in Jamesport, the Jamesport Manor Inn is a venue unparalleled in beauty on the North Fork. Throughout the years Christopher Michael has worked at almost every venue on the North Fork and experienced the many unique beauties that each has to offer. During the winter of 2005, the historic Jamesport Manor Inn on Manor Lane in Jamesport was renovated to become a truly North Fork experience. The ambiance of the historic manor is just the tip of the iceberg. Tucked away through our Apple Orchard is a beautifully manicured open field with views of the adjacent tree farm. The Orchard, can be tented to fit over 250 people. With no site fee and all=inclusive pricing (which includes the tent) of $140 per person to rent The Courtyard, and $180 all inclusive pricing to rent The Orchard, it beats the pricing of any outdoor venue in the area. For detailed pricing click Here. If you're looking for an outdoor, country feel for your wedding, look no further. You will not find anything comparable--no other outdoor venue will beat the price or beauty. Check out our website for more photos! With great excitement, Matt Kar and Christopher Michael Catering, will now be offering our five star food and service at one of the most beautiful waterfront spots on the North Fork. Flanders Men's Club offers breathtaking water views for your large or small event, while not breaking the bank. With a site fee of just $3,500 and all-inclusive pricing (including tent!) of $185 per person you will not find anything comparable on the North Fork. Schedule a time to see what this stunning site has to offer by emailing cmnorthfork@gmail.com with the topic line "Flanders Men's Club". If your looking for a view of the water look no further. With great excitement, Matt Kar and Christopher Michael Catering, will now be offering our five star food and service at one of the most beautiful Breweries on the North Fork. The North Fork of Long Island is known for its bucolic countryside with endless stretches of land, bountiful vineyards and iconic potato barns. The 43-acreage farmland of Jamesport Farm Brewery was once a potato farm in the height of Long Island’s potato farming days.Interestingly, hop plants prefer the same soils as potatoes. Jamesport Farm Brewery is the only “Farm to Pint” brewery on Long Island that grows and harvests the majority of the ingredients, such as hops and barley, used for its craft beers. For pricing and to schedule a time to see what this beautiful unique brewery has to offer, email cmnorthfork@gmail.com with the subject line “Jamesport Farm Brewery”. If your looking for breath taking farm views and delicious beer look no further and book your event today! Our 1953 GMC potato truck has been transformed into a party talking piece. We take pride in supporting local handcraft beer, wine, cider, spirits, and incorporate them into custom cocktails on your very own bar truck. What is a bar with out some appetizers? We can also provide themed food stations such as Raw Bar, Taco Station, Tuscan Table, Barbecue, or Gourmet Grilled Cheese. We can even have beer and wine pairing menus! How about a day after party refershing Bloody Mary and Mimosa Bar, with a Breakfast Buffet. Choose your style: China and glassware or simple plastic we got you covered! Book our Bar Truck for your next event! For more information and price packages please email cmnorthfork@gmail.com or call us (631) 722-0500. All summer long at Jamesport Farm Brewery on the weekends! “We had an outdoor wedding at a private home. We hired Christopher Michael Caterers because he had catered my cousins wedding. Aside from that they took care of everything for us. From the moment the day started to the very end the staff treated our guests like royalty. Our guests keep saying it was the best wedding food they’ve ever had at a wedding!! The staff was professional and courteous and did so many things on the fly to help cater to our guests. The raw bar on the beach should be on the cover of a bridal magazine!!!! The food was delicious and plentiful. The staff maintained a perfect pace with our entire wedding day. As mother of the bride I couldn’t have been happier. When Cynthia or Christine spoke to me they made sure they had my attention and would ex[plain to me in direct terms what was happening now and next. They have a way that let me fully enjoy my daughters wedding and still make critical decisions their experience and professionalism is beyond words. I would recommend CM caterers for any affair but especially for a private home wedding because they think of all the details and work out what they need. Thank you”. “Wow, words cannot express our gratitude for the AMAZING job by Matt Karr and his entire staff for our wedding at The Old Field on June 23rd, 2018. I booked Christopher Michael Catering 10 months in advance of the date. This was on the early side but I did not want to risk losing out on what would be our centerpiece vendor for the entire event. Matt was so easy to work with from day one. I had initially solicited all the major catering vendors on the North Fork. Matt was far and away the most organized and responsive of everyone I reached out to. I had full menus and price lists within a day and he answered all questions right away. His menus were so good! He had great options for every palate, with very fair pricing and great add on options such as the raw bar and lobster rolls. When we met in person, he put all our concerns to ease. He’s been doing large events and weddings for decades now and knows all the venues, other vendors, etc. I was struggling to find a tent vendor who could provide what we wanted, his suggestion “just call Bobby over at American Tent, tell him I sent you” was perfect! Not only did the team at American Tent deliver a beautiful Sail Cloth tent at a fraction of the cost of the other vendors, I had peace of mind knowing that Matt, who helped me plan all the final details, knew the other vendors very well and would step in if I needed assistance. In deciding our menu for the event, Matt hosted us for a delicious dinner at the Manor where we got to sample all sort of dishes to get a taste for his quality and vision. Everything we tasted was perfect. Picking the menu after that was a breeze (filet mignon with horseradish dill sauce, chicken and lemon capers, pesto ravioli, raw bar, etc.) Months later we still have friends telling us it was hands down the BEST wedding food they’ve ever had. In addition to the food, Matt and his team went above and beyond, essentially filling in as assistant wedding planners and coordinators. He provided me with sample timelines for the day as well as how he likes to coordinate with the other vendors to ensure the entire event runs smooth from start to finish. His event manager, Cynthia, seemed to be everywhere at once the entire day of my wedding. She was at my Mom’s and Day of Coordinator’s sides for much of the event, taking care of everything before it could even be asked. She knew exactly where and when for every detail, beyond just the food, working with the DJ, photographers, etc. The serving staff was also amazingly professional and courteous. I went with French style service so food came out on platters and was served to each person HOT! So many people were shocked that everything was fresh and hot, the timing and prep was perfect. I can’t imagine my day without their entire team. Every single one of them went above and beyond all our expectations to deliver the wedding of our dreams. To anyone looking for the perfect caterer for your event, Matt and Christopher Michael is your answer”. "After meeting with many caterers with our wedding planner (Laura Mastriano-who was absolutely fantastic, btw) we decided to go with Christopher Michael Caterers. Our wedding was on July 2nd, 2016 at the Hempstead House in Sands Point. It's a unique venue that requires you to bring in EVERYTHING. It was quite an undertaking... Ok well first let me say why we chose Christopher Michael and then I'll get into how they executed. When we first met with Matt, we hit it off. Matt is the type of guy that wants the food to be perfect. He's the type of guy that you want to have a drink with. From the moment we saw Matt's menu we knew he was our top choice. He reassured us that not only was his company the best fit but he could execute everything to perfection. That was exactly what we were looking for. We discussed prices (very fair for the level we were looking for), logistics with our production company and also challenges if we wanted to make last minute changes (which we did). All along the way his responsiveness could not have been better. If we wanted to something changed, he changed it at no extra cost.. His "go to" line is "sure, whatever you want." We trusted him and that was HUGE to us. We decided to have a "recovery" brunch at our home the next day with around 150 people and we chose Matt for that as well. The execution was FLAWLESS! Our cocktail reception perfectly captured our Gatsby themed wedding. Three high end cuts of meat, three fresh seafood options and everything else from salads to the raw bar/slider station, small patron bottles filled with Margaritas.. the list goes on and on. The feedback from our guests was incredible. The "wedding of a century" is what we've heard repeated over and over again. Matts high-end professionalism matched the story tale execution of our event. Appetizers were just amazing.. custom designed, delicious and decadent. I rarely write reviews but I feel like I owed Matt and his team the respect. The next day at our house was a repeat of the night before (with some chuckles from the staff seeing us just a tad tired). A few things that we got to know about Matt through the process. Why is it called Christopher Michael Caterers? Thats his boys names. We thought that was just awesome because we're such family people. Matts staff has been with him for years and years unlike some of the other caterers who hire temp help for big events. He wants you to have fun!! He makes excellent suggestions.. Many times we disagreed with his opinion of placement of chairs/stations, etc. In the end we listened to Matt and, admittedly, he was right every time. My suggestion to anyone on the east end of Long Island, Hamptons or the North Fork-or anywhere on LI would be to meet with him and you'll see what I mean. Several times he said to me, you can do that but it's a complete waste of money.. I'll do whatever you want but I'd hate to see you spend the money if you don't need too. Who does that? Granted we wanted the best of the best.. and we got it! Thanks Matt & Staff for making our special day the best day of our lives. You'll forever be apart of us. Cheers!" "Our wedding would not have been as big of a hit as it was without all of the hard work and delicious food from Matt and the rest of the team at Christopher Michael. After doing our homework on several caterers, we ultimately decided on Christopher Michael for numerous reasons, perhaps mostly because of the experience and professionalism of Matt. From our initial conversations, to our first meeting at the Jamesport Manor Inn (which we would also recommend for a fantastic dinner), to the dozens of questions and specific details we discussed over the phone and e-mails, Matt was always extremely helpful and quick to respond. Similarly, as we got closer to the big day, Matt offered his insights and experiences on our timeline for the reception and other critical details that we hadn't considered, even though those things weren't necessarily in the scope of our relationship. He also went out of his way to personally deliver some of the tables and chairs to our venue a day early for us to use for our rehearsal dinner. In terms of the day of, the experience could not have gone any better. The entire staff that was onsite acted professionally and efficiently; aside from the times that they were serving, they were never in the way, but always available when needed - they run a very smooth ship! And last, but certainly not least, the food itself was incredible! After getting Matt's opinion, we ultimately decided to go with French style service, giving our guests the option to choose from three entrees; everyone loved that they had the option to choose from three delicious entrees and that they could get seconds, or even thirds, if they wanted, although many of the guests had already filled up already on all of the delicious h'or deurves at cocktail hour! Even over a month later, we have at least one of our guests bring up how incredible the food was almost every day. Overall, from start to finish, working with the entire Christopher Michael team was as great of an experience as we could have expected. Not only did we have an incredible meal at our wedding, but we had a knowledgeable, professional, and experienced team behind it, led by Matt. We wouldn't change a thing!" "We had our wedding at Pellegrini vineyard on 8/30/15. Christopher Michael did all the catering for our event. Matt's crew did an absolutely fabulous job. Very professional and friendly. From the pass around hors d'oeuvres to the French style service during the reception. The food was prepared impeccably. The quality and presentation of the food was absolutely perfect. Oh and the food was delicious as well. His crew did such a great job. During the cocktail hour his crew was passing around hors d'oeuvres. And we had a few elderly people attending our event sitting at their respective tables and weren't able to move around so good. We asked his crew to make sure get hors d' oeuvres. On their own, his crew made up a few trays hors d' oeuvres to bring them so they would have some. We thought that was so great. The following morning we had our family after the wedding brunch. We had the brunch at Jamesport Manor Inn. Very quaint place. Great place breakfast, brunch, lunch and dinner. The same quality and presentation of the food. They have a party room upstairs which is great for groups and the are completely handicap accessible. We would recommend highly to anyone interested in going out to Jamesport area or to the vineyards on the east end to try this place. Thank you Matt and crew." "I'll admit at first glance of the Christopher Michael Catering doesn't appear to be a top notch caterer. Their website isn't fancy and the owner Matt Karr is a straight shooter. He's not going to give you a bunch of wedding pillow talk about he's going to make your antipasto table look beautiful, but believe me he's going to make it beautiful and more importantly he's also going to make sure you have enough of it to feed your guests. That's the thing about Matt he's a pro - he doesn't give big fancy presentations because his track record speaks for itself. He's been in the catering business on the North Fork for over 20 years, he's done every type of event imaginable, and has trucks outfitted with mobile kitchens to handle any sized event without the need for rental equipment. I had a lot of concerns about my tented wedding for 250 people on Shelter Island, but Matt walked me, my fiance, and my parents through it and quickly proved that he was the man for the job. During the entire planning process Matt was also super helpful. I requested a few changes to his proposal and he easily accommodated them, and was extremely fair about price differences. In fact all his fees were quite reasonable and a world of difference from some other catering quotes I received. The day of my wedding I felt confident that it would be perfect and it was - my husband was concerned about lines at the bars and there were none, everyone raved about the food (the lamb chops at cocktail hour were a huge hit! ), and the set-up for the dessert table was stunning (note I brought in dessert from another vendor and they set it up). I also had no need to be concerned about running out of food - we had leftovers which they kindly packed up and our family enjoyed the next day. I also have to give many props and thanks to Christine his catering manager. She runs the front of the house seamlessly and I think it says a lot about the whole operation that she has worked with Matt for 20 years. The entire Christopher Michael team was courteous, attentive and flexible. I also highly recommend their French style service - it's a bit Downtown Abbey and really impressed our guests. If you want a caterer that’s reliable, ready for anything, and turns out delicious food look no further than Christopher Michael." We are still getting compliments to this day about how great the food was. The tables, Linens, Tuscan table, even the presentation of the food on the trays as the servers came around during cocktail hour was perfect. No one was ever waiting for a server to come by and the bartenders kept the drinks flowing. We can’t thank you enough and will highly recommend you to anyone in need of a great caterer. We would also like to thank your whole staff at the Jamesport manor for making the rehearsal dinner perfect as well. Christine and Kerri were amazing to work and so accommodating. The Gallery was a perfect room for 44 guests and it was classy from start to finish but extremely fun as well! Food there was also top notch! For more testimonials, please visit our official page over at the Knot. Christopher Michael Catering is located within the town of Jamesport, New York at 370 Manor Lane. Please feel free to contact us by phone (631) 722-0500), email at cmnorthfork@gmail.com, or via our contact form below. We hope to see you soon!